Our house became the outdoor hangout over the summer. Most weekend nights and even plenty of weeknights, there was a fire going and lots of extra kids (besides my 5) hanging around the outdoor bar and patio. There were usually late night burgers or bratwurst or graham crackers and marshmallows and hershey bars were pulled out. Over Labor Day weekend, I went to peruse what was in the garage fridge. Some stouts. Some ciders. Some hoppy IPAs. Some Lime-A-Ritas. Some wine. 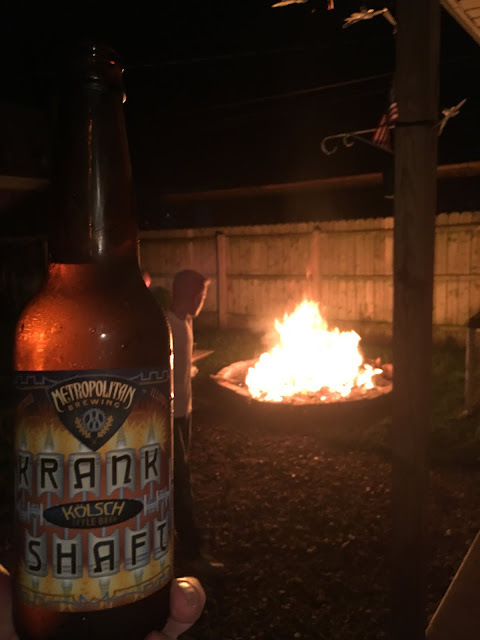 But, I decided to go with a Krankshaft Kolsch from Metropolitan Brewing out of Chicago. I had tried it earlier in the summer on a beer cruise at Navy Pier and it's a light, smooth, slightly citrusy variety that just screams "Summer" and "Chill Out," so I popped one open and that's what I did. Good Stuff. And at 5% ABV, even a lightweight like me can enjoy a couple.